The New York Times’s editorial “Battle Over Eisenhower in Washington” falsely poses the debate over Frank Gehry’s proposed memorial for Dwight Eisenhower as pitting Ike’s grandchildren against World War II veterans. This is not so. The Gehry design is at risk because even a host of official approvals cannot hide the fact that the design is an unsuitable tribute to the Allied general and 34th president. For Congress to yield such power to family members, however, cuts against the whole idea of a national consensus to honor a national hero. Precisely! But the ability to achieve a national consensus is exactly what is at stake, and why it is the Gehry design itself, not the Eisenhower grandchildren, that has held the memorial hostage. Of course, the Times editorial does not mention the outrageous taxpayer cost, the pitiful amount of private money raised (most such memorials are privately funded), or the lack of openness and transparency of the design competition that “selected” Gehry, the propriety of which has been investigated by the House of Representatives. If the Gehry design is built, the entire idea of national consensus on any issue, or even general cultural understanding, will receive a severe blow. Our nation is already divided, some would say against itself. Part of this is inevitable, even necessary, in a complex society such as ours. Gehry’s design will make coming together for any unified purpose all the more difficult. It will become conventional for monuments to be incomprehensible, because a bland nothingburger of meaning is the least potentially offensive. This is already conventional, almost mandatory, in architecture for public and private buildings. Some, who look at the semiotic roots of modern architecture, believe that is the whole idea. Unlike other fields, the field of architecture, at least among its top thinkers, never abandoned the deconstructivist philosophy that the legal profession and several fields of academia successfully resisted in the ’70s and ’80s. The idea of undermining meaning in the structure of language always seemed, for these ideologues, the best way undermine the structures of the state. For example, just look at the queasy feeling modernists get from the idea of beauty. That is because beauty raises feelings that are understood by all. Even Gehry would not claim his design is beautiful. He once mocked the classical temple style of the Lincoln Memorial. He says architecture should reflect society’s turmoil, not try to ameliorate it. His own absurd design to “commemorate” Eisenhower is the strongest testament of its unsuitability. 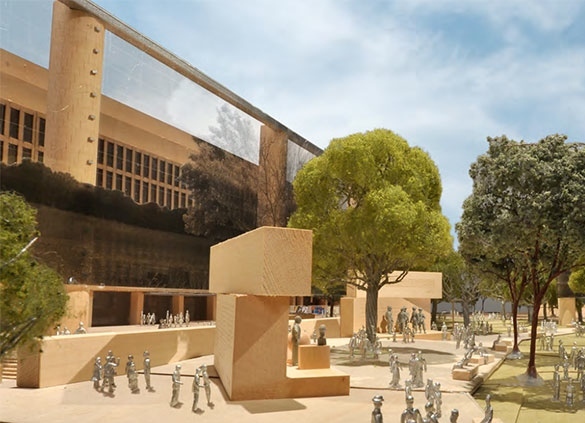 This entry was posted in Architects, Architecture, Architecture Education, Architecture History, Art and design and tagged Congress, Dwight Eisenhower, Frank Gehry, Memorials, National Capital Planning Commission. Bookmark the permalink. Thank you sir ! Well writen ! !